King Leopold II’s personal rule of the vast Congo Free State anticipated the horrors of the 20th century, argues Tim Stanley. The pioneering traveller was born on 13 October 1862. In June 1812 Britain and the United States went to war. The conflict was a relatively minor affair, but its consequences were great. The eldest son of King John was born on October 1st, 1207. Peter Hennessy looks back to his 1994 Longman-History Today lecture, delivered just as a revolution in British contemporary history was beginning to bear fruit. In recent decades few fields of historical inquiry have produced as rich a body of work as the British Civil Wars. Sarah Mortimer offers a guide to the latest scholarship. 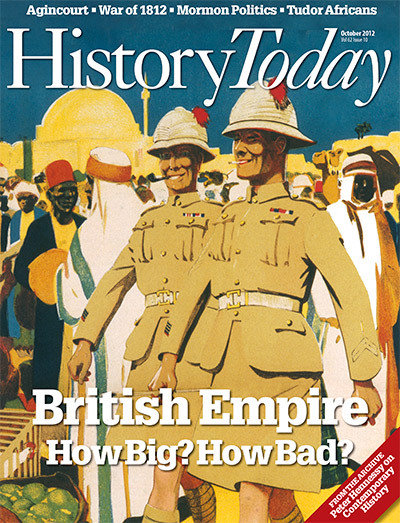 The ‘British Empire’ was the name given by imperialists in the late 19th century to Britain’s territorial possessions. It was meant to create an image of unity and strength. But such a view is illusory, argues Bernard Porter. J.L. Laynesmith unravels one of the mysteries of the Bayeux Tapestry. Graeme Garrard recalls Isaac Brock, the Guernsey-born army officer still celebrated in Canada for his part in defending British North America from the United States in the War of 1812. Roger Hudson sheds light on a haunting photograph from the Greek Civil War. The enmity between England and France is an ancient one. But the museum dedicated to a famous English victory offers hope for future relations between the two countries, writes Stephen Cooper. US presidential candidate Mitt Romney is a Mormon, which is a problem for some voters. But, says Andrew Preston, so was the Catholicism of John F. Kennedy and it did not stop him winning the 1960 election. Tudor Africans: What's in a Name? Onyeka explores the changing meanings of words for Africans in Tudor England. Constantine won a great victory on October 28th, 312. William Hogarth’s life was a microcosm of the three main themes of Georgian life, argues Michael Dean. Pity poor Isabella Robinson. Married to Henry, an ‘uncongenial partner’ at best and at worst a ‘mean and grasping’ philistine who had secretly sired two children with his mistress, Isabella seeks solace with a family friend, Dr Edward Lane. After her husband happens upon her unlocked diary, her most private thoughts about Dr Lane and her marriage, she becomes the subject of a great Victorian scandal. Henry accuses her of adultery and in 1858 Mrs.